When anyone buys a Spectrum +3 these days the most common fault is a non-working drive. 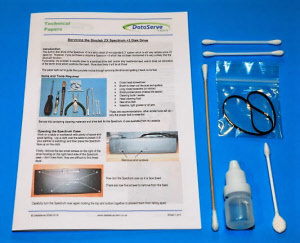 This is a complete service kit for the Spectrum +3 complete with new drive belt, head & drive motor capstan cleaning solution, capstan and pulley wheel cleaning bud, special shaped tip cleaning tool for the read/write head and full four page fully illustrated instruction manual. All you need (except basic tools) to service the drive of your +3 and restore it to full working condition. The manual is easy to read and understand with clear step by step photographs.